***BOX OFFICE OPENS THIS FRIDAY 8 SEPTEMBER at 8am! 4.45pm: DISNEY’S BEAUTY & THE BEAST (CERT PG) – Screen 1 (max 420 seats). Better on the BIG screen, see it on our fabulous new 30′ screen! Wheelchair accessible. 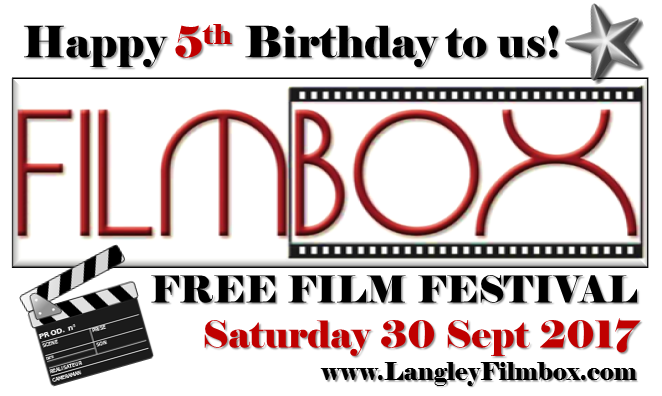 A date for your diary… Bring your family and friends on Saturday 30 September 2017 to enjoy FOUR FREE films and help us celebrate our 5th Birthday! There’ll be plenty to eat and drink so you can stay all afternoon and evening if you like and there’ll be music too. FREE off-street car parking. ‘Beauty and the Beast’ (cert PG) and ‘Their Finest’ (cert 12A) will be in Screen 1 and ‘The Red Turtle’ (cert PG) and ‘T2 Trainspotting’ (cert 18) in Screen 2. We abide by BBFC film classification. Our Screen 1 (seats 418) has a recently-installed superb new cinema screen and is wheelchair accessible in both stalls and circle via a lift (please email us in advance to be assured of the best service for booking access seats). Our Screen 2 studio cinema seats 90 and is sadly not wheelchair accessible. Our Performance Hall – seats 400+ – wheelchair accessible in stalls and circle via a lift. Our FREE FILM FESTIVAL will be Open to All, even if you’re not a Member of FILMBOX or have never been before! Ample FREE off-street car parking! We’ll be opening our Festival Box Office closer to the time, but FILMBOX Members get first dibs at booking allocated seats for the FREE FILM FESTIVAL. Keep any eye out for the dates we’ll open the Festival Box Office! Join us on Friday 17 November 2017, for a very special film & live music event – a screening of the Michael Powell award-nominated Best British Film at this year’s Edinburgh International Film Festival. A screening of a brand new silent film, LONDON SYMPHONY, directed by Alex Barrett, with a live performance of its original music score, composed by James McWilliam, by the Covent Garden Sinfonia chamber orchestra (Artistic Director Ben Palmer), in our magnificent theatre, the Bromley Hall (also known as the Performance Hall) – in Beckenham, Kent, BR3 3BP – South East London. FREE off-street parking. Composer of the uplifting and soaring new original score for LONDON SYMPHONY, James McWilliam (above). Performed LIVE by the chamber orchestra of Covent Garden Sinfonia (formerly known as the Orchestra of St. Paul’s), with Ben Palmer, Artistic Director of CGS (above). Date & Time: Friday 17 November 2017 – Licensed bar opens 7pm, film programme starts at 7.45pm – on sale to the public now (allocated seating so please book in advance asap). Kentish ice creams and sorbets by Simply Ice Cream. We’ll also be having a Q&A with the director, Alex Barrett and possibly some additional creative collaborators from the film. Venue: FILMBOX Community Cinema, Langley Park Centre for the Performing Arts, South Eden Park Road, Beckenham, Kent, BR3 3BP. FREE off-street car parking, but close to Eden Park train station, many bus links. With this wonderful black-and-white journey through the city of London, director Alex Barrett brings us a gloriously beautiful and enjoyable modern-day variation on the city symphonies of the 1920s urban cinema (such as the 1929 film Man With A Movie Camera). His stunning visuals, combined with James McWilliam’s stirring music, help take the spectator on a poetic journey through London, exploring its rich diversity of culture, architecture and religion. It is a meditative and blissful film that celebrates a vibrant and visually stunning city. Contains flashing images. Please note: If you think that a black and white silent film isn’t for you, PLEASE reconsider as we’re sure that this will be a rich and life-enhancing experience and a timely reminder for us all of the beauty of London and its many communities, through outstanding cinematography and editing (on our fab new professional 30′ BIG cinema screen!) and the pleasure and power of live music – so please don’t miss this special event we want to share with you to celebrate FILMBOX’s 5th Birthday year. BOX OFFICE: https://www.TicketSource.co.uk/Filmbox We pay booking fees. Join us on Friday 17 November 2017, for a very special film & live music event – a screening of the Michael Powell award-nominated Best British Film at this week’s Edinburgh International Film Festival. A screening of a brand new silent film, LONDON SYMPHONY, directed by Alex Barrett, with a live performance of its original music score, composed by James McWilliam, by the Covent Garden Sinfonia chamber orchestra (Artistic Director Ben Palmer), in our magnificent theatre, the Bromley Hall (also known as the Performance Hall) – in Beckenham, Kent, South East London. Performed LIVE by the chamber orchestra of Covent Garden Sinfonia, with Ben Palmer, Artistic Director of CGS (above). We’ll also be having an after film Q&A with the director, Alex Barrett and possibly some additional creative collaborators from LONDON SYMPHONY. Please note: If you think that a black and white silent film isn’t for you, PLEASE reconsider as we’re sure that this will be a rich and life-enhancing experience and a timely reminder for us all of the beauty of London and its communities, through outstanding cinematography and editing (on our fab new professional BIG screen!) and the pleasure and power of live music – so please don’t miss this special event we want to share with you to celebrate FILMBOX’s 5th Birthday year. We now show TWO films per FILMBOX night in Beckenham! Book your seat now or tickets available on the door TONIGHT for one of the greatest British films ever made – A MATTER OF LIFE AND DEATH (cert U) – David Niven stars in Powell and Pressburger’s fabulous WW2 romantic drama from 1946 – once seen, never forgotten, better on the BIG screen. Over 60 booked for this so far. Enjoy an early Valentine’s Day treat or just a wonderful film. OR – see hit comedy BRIDGET JONES’ BABY (cert 15). Renee Zellwegger, Colin Firth and Patrick Dempsey star in the latest update in Bridget’s life – laughter and tears guaranteed! Over 120 booked for this so far. 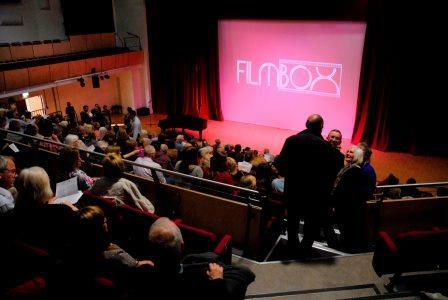 Venue box office open at 7pm – online box office here for details of location and times etc: https://www.ticketsource.co.uk/filmbox Tickets £8 and £5 (under 18s).